Whether you're an armchair tourist, are visiting Rome for the first time, or are a veteran of the city's charms, travelers of all ages and stages will benefit from this fascinating guidebook to Rome's ancient city. Rome Alive describes the Site and Foundation of Rome, Walls and Aqueducts, the Capitoline Hill, the Roman Forum, the Upper Sacra Via, the Palatine Hill, the Colosseum Area, the Imperial Fora, the Campus Martius, the Forum Boarium and Aventine, and the Circus Maximus to Tomb of Scipios, all using the words of the ancients who knew them best. Aicher's commentary orients the visitor to each site's ancient significance. Photographs, maps, and floorplans abound, all making this a one-of-a-kind guide. A separate volume of sources in Greek and Latin is available for scholars who want access to the original texts. 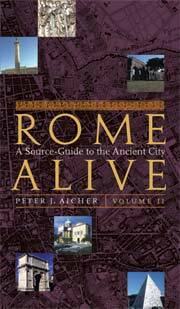 Rome Alive, Volume II is a companion to Volume I, aimed at the scholar-traveler who wants access to the Latin and Greek original sources translated into English in Volume I. This unique original-language guide to ancient Rome's monuments gathers together compelling observations of the ancient authors who witnessed Rome's zenith. Key maps from Volume I are included. PJ Aicher, Rome Alive. A Source-Guide to the Ancient City. Vol. 2, Original Sources (Wauconda, IL: Bolchazy-Carducci, 2004, paper $39) xi and 205 pp., 22figs. Indexed. LCN:2003023423. ISBN 0-86516-507-6 The first volume in this project [NTA 48, p. 441] contained introductions to and translations of ancient texts pertaining to Rome. This volume provides the Greek and Latin texts of the sources translated in the first volume under the same eleven headings: the site and foundation of Rome, walls and aqueducts, the Capitoline Hill, the Roman Forum, the upper Sacra Via, the Palatine Hill, the Colusseum area, the imperial forums, the Campus Martius, the Forum Boarium and Aventine, and the Circus Maximus to the Tomb of the Scipios. Aicher is associate professor of classics at the University of Southern Maine.